Regularly used, rarely celebrated. The Col de Peyresourde is often a hyphen, linking different places during a stage of the Tour de France and that’s its charm, a crossing point with a useful halt at the top. The Route: the D618 heads west out of Bagnères-de-Luchon. It is 15.2km long at an average of 6.1% and reaches a height of 1569m above sea level. The Feel: once it was plain old Luchon then it became Bagnères-de-Luchon, “Luchon baths” and a spa town with its own railway line and guests including royalty and emperors. The glory days are long gone and like many Pyrenean towns it has an old feel, as if held back in time by 20 years. As you leave town you pas the hydroelectric works which originally date from the nineteenth century but could still give the town a future. The road is wide and bites from the start with a slope over 8% for the first kilometre. On the right is a small sign for a “source ferrugineuse”, iron-rich spring water that helped make the spa town. There’s a brief descent and then it kicks up again. There’s no more descending but there are several flatter sections to come, like landings on a staircase. For example the profile above shows the village of Saint Aventin after 5km where the road is flat for a moment rather than just a couple of percentage points less. Before Saint Aventin there’s the turning on the right for the Port de Balès, an option for another day and one of the newest road climbs in the area being tarmacked in 2006. What’s particular about the Peyresourde climb is its width and the long straight sections. At times the road is lined by poplar trees like something out of a Sisley painting or any road on the plains of France. Only it’s unmistakeably in the mountains, look beyond the road and there are large views of the pastures and the mountains. Closer to the top and there’s a point where you look up and instead of the road rising up the flanks of the valley you notice it zig-zagging to reach the pass, as if the engineers didn’t make the road ascend enough and had to make up for the lost elevation with some steep ramps. But ignore the optical illusion, the road ahead looks steep but don’t hold back, it’s no harder than what you are already riding on, just with some hairpins to aim for between the ramps. At the top there’s the usual sign and a car park and in summer people in sports cars or on motorbikes high five each other – what’s that all about? – for making it up. 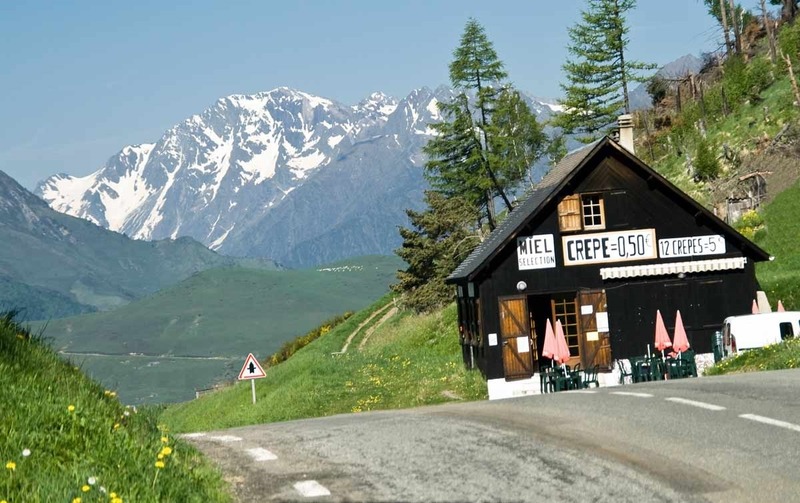 There’s also a hut selling pancakes and drinks which is part of this climb’s purpose, the place is an institution run by Alain Viguerie since the 1970s. You won’t climb it for its own sake but instead are more likely to go via the Peyresourde on your way to somewhere else. In which case a pancake for 60 cents – or 10 for €5 – is useful to keep you going. The Verdict: it lacks a bit of charm, this is a big boulevard, almost a highway but thankfully very light on traffic. 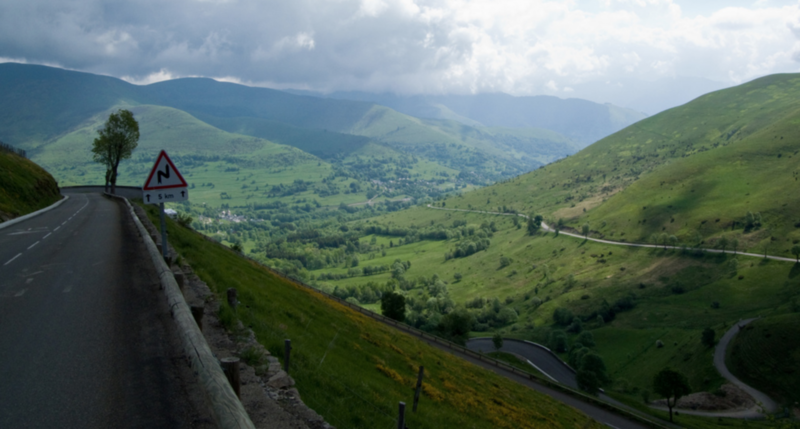 Instead it’s a useful passage across the Pyrenees – and part of the road joining the Atlantic to the Mediterranean and bang in middle too- with a handy café at the top, if you cross the Pyrenees from east to west or vice versa this is bound to be on the way. Name: Peyre is an old word for a stone or a rock. Sourde means deaf so it sounds like “Deafstone pass” only the sourde is derived from sorda meaning a stone that has risen up or surged out of the ground. History: the pass will have been used since ancient times but was made into a road under Napoleonic times when the thermal baths and spring waters were attributed with healing properties and became big business. Race history: first used in 1910 it’s been used 66 times and regularly, several times each decade. 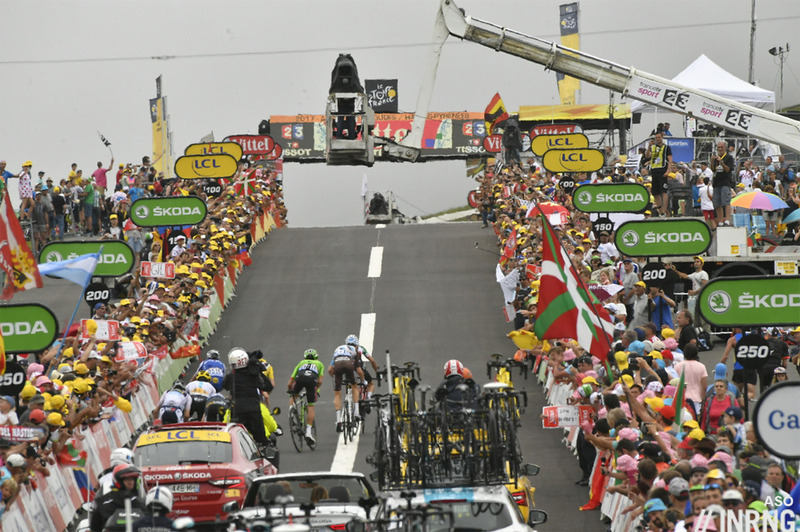 This reflects its position in the Pyrenees, a natural crossing point en route to other finishes. The nearby ski resort of Peyragudes, formed by the merger of the Peyresourde ski resort and the other of Agudes has also hosted the Tour de France a summit finish and the Vuelta a Espana too and in 2017 they used the altiport runway for the finish (pictured); the previous year Chris Froome attacked over the top and exploited the fast descent to take the yellow jersey and keep it to Paris. Local race the Route d’Occitanie (ex Route du Sud) has also visited several times. Future: it’s going to be used as the first climb of Stage 17 of the Tour de France this summer, the ultra-short 65km dash to the Col de Portet. Travel and Access: you could stay in Luchon at the foot of the climb for a week and not get bored. 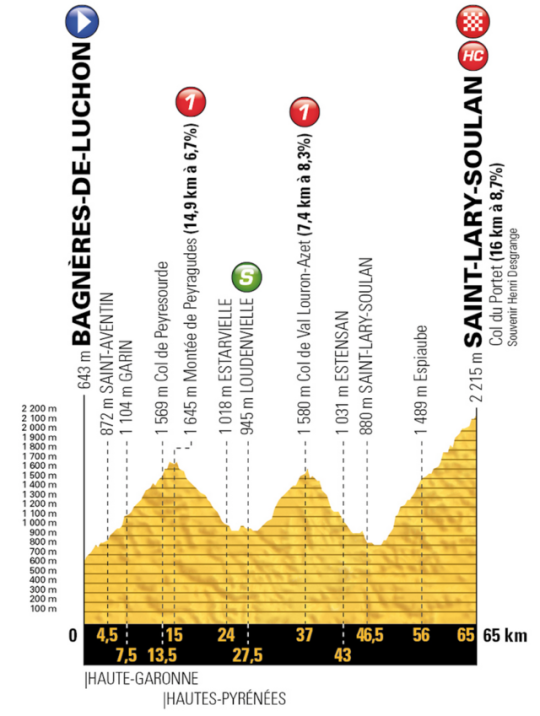 There’s the climb of Superbagnères above, the Col du Portillon to the east, the Port de Balès and nearby delights like the Col de Menté and the whole Comminges area with many smaller mountain passes. Luchon has railway line… but no trains at the moment, they’re due back in late 2020 apparently. It’s near the A62 autoroute and Toulouse airport is 90 minutes away. Last time I was up there you paid with francs, but otherwise it doesn’t look like much has changed. The most interesting aspect of this article is that there is still somewhere you can buy something for 50 cents. If the same thing was at the top of a much smaller hill somewhere in England it would likely charge at least £5. Probably more like £7.50. And it would taste much worse as well. Who goes to France to enjoy the coffee? Some things you just gotta let go…like pasta in France. I was with a group years ago that insisted we go to a place (in St. Lary perhaps?) that made their own. Problem was it seemed they changed the water they boiled it in about as often as you’d change the oil in your car! Instead enjoy the great pastry, cheese, wine, roast chickens, salads with wonderful croutons, etc. This from an unabashed Italo-phile! Vive Le France…but I’ll still spend as much time as possible in Italy. Too true, the Basque cheese and ham in St Lary made up for it 10 time’s over. Was also a weekend market on with a very friendly guy selling roast ducks, guinea fowl, spatchcock and pidgeons straight off the rotisserie. Fine riding and fine food! I saw an article from the 90s with the owner taking pride in the low price then, two francs. I digress a little here but on the subject of ‘the feel’ of long gone glory days of Pyrenean towns, I’d mention Canfranc railway station. A remarkable architectural wonder, just on the Spanish side of the border. It’s closest to Stage 19 of the Tour, but can be accessed via train from Pau and perhaps with a bicycle trip or two then added on? Fabulous reading around it too. For the first time, a road I’ve ridden. The fact that your description is less glowing than other “roads to ride” has me wondering was treasures await on a return trip to Europe. 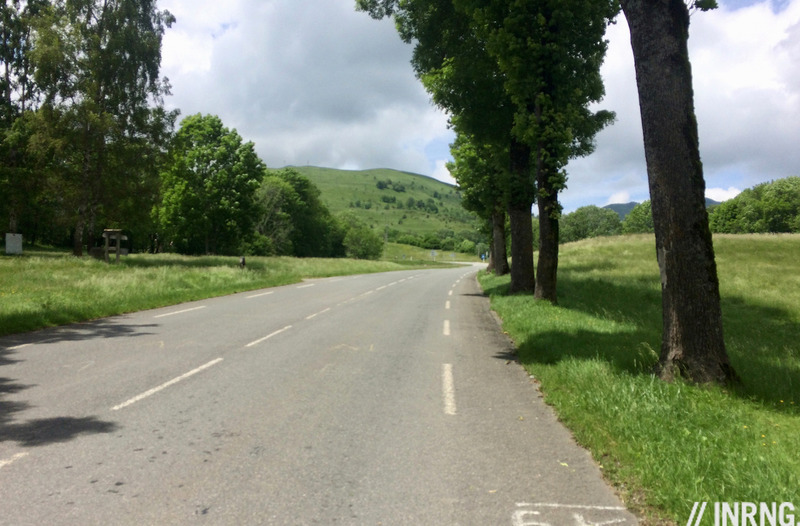 For my part I thought this ride was spectacular; postcard views, and a cheering section on the way up (we rode it a couple of days before the Froome top-tube attack, French in their RV’s were already staked out). The crepes at the top rescued my son from what otherwise might have been a hunger knock-out. It’s still scenic but if you want big open pastures and high views you can more on the, say, the Col Aubisque probably has more. If you want hairpins then the nearby Col de Menté etc. 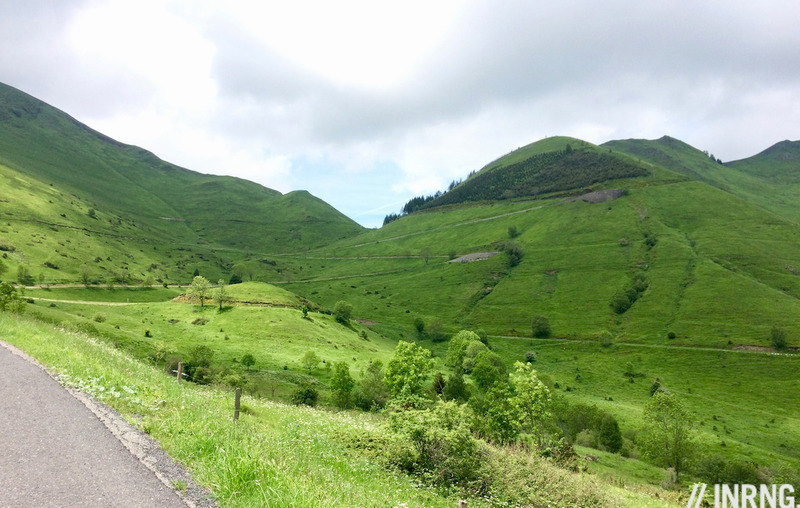 It’s an okay climb, but incredible descent (into Luchon). So, so fast. +90kph easy. Squeaky bum time. If you do stay in the faded jewel that is Luchon make sure you ride or even take the ski lift to the summit of Superbagnères. At the summit is a rather spooky grand old hotel built in the town’s spa heyday with a wonderful creaky wooden above ground pool overlooking the whole valley. I have found Luchon a wonderful base for exploring the many famous nearby Pyrénéan climbs and would absolutely recommend a summer visit. Ahhh, the Pyrenees. We spent some days in Saint Larry Soulan last year. Not much action during May, but fine cycling weather and day trips to Aspin-Tourmalet, Azet-Peyresourde, Portet, Piau-Engualy and my fav… Lac de Cap de Long… A quite road through protected forrests and Alps be lakes up to 2200m. Very worthy of an INRNG roads to ride! I absolutely love these. My favourite part of your blog. Thank you! Thanks, more to come with several upcoming climbs from the Tour de France to be added and as well as others from different places. For some reason this col is the one I most closely associate with Phil Liggett – whenever I read it on the page I can hear him saying it. Love these segments – I’ve based a number of trips around some of your descriptions. You’re right of course, I was getting mixed up over the price for one and the €5 for 10. Still cheap. Well it says €0.50 in the picture you posted, so understandable. It also says twelve pancakes for five euros… Still super cheap. This was my first recognisable TdF climb I ever attempted, and it is also the one I’ve ridden the most (tied with the Aspin, and Ventoux). The descents off it (both ways) are fast and flowing, and no technical prowess is really required. I agree with Inrng’s assessment whole heartedly. One climb to put fear in your heart (if you don’t fancy riding up the Peyresourde and the Aspin to find the Tourmalet) is the Col de Portet d’Aspet which has a death count. Although it is not a long climb, and there are no real views to be had, it is fearsome for its extreme gradient. It’s like cycling up a wall, with a section that seems to be 20% for 1km. It’s also horrendously humid as it’s largely canopied by the surrounding trees and the air is quite still. You’ll be proud you stayed in the saddle and survived when you reached the top. Looks like the Aubisque is in a race against time to be fixed in the meantime. While maybe not too charming on the way up from Luchon, it makes a great downhill run if you’re going west to east into that town. Was screaming down that way a few years ago and noticed there was a truck on my tail, seemingly impatient to pass me. I came to a wide spot and motioned for him to pass and he opened the passenger side window when he came even with me. Expecting some swear words to come flying out the window, I was surprised when he yelled out, “Soixante-dix!” and gave me a thumbs-up. Took me a second to realize he had clocked me at 42mph… Gotta love the French. Had to laugh at the people in car and motorcycles high fiving each other at the top comment. We rode Stelvio a few years back and the guys on motor bikes were doing exactly that – just seemed so lame. We did get a bit of revenge on the descent as we were able to pass quite a few of them on the downhill and they did not like that. Really enjoy these articles – not ridden in France as yet – maybe next year, so keep them coming. Yes, avoid Passo Stelvio on Sunday. The only thing worse than these bozos “celebrating” their great feats of throttle twisting or gas pedal mashing are the ones who roar up and down the thing like it’s their personal racetrack. The vast majority of them seem to have license plates from either Switzerland or Germany. There were rumors a few years ago about making this a toll-road. That might have cut this activity down somewhat, but I’ve heard nothing about it recently. A seriously enforced radar speed-trap might do the trick as well? As a biker from the UK, I won’t admit to high-fiving on the cols, it’s definitely naff. I would argue that one does feel overwhelmingly positive about the fantastic views on the cols. Even though cresting them is unsurprisingly more satisfying under pedal power than engine power. (I did the Raid in 2013 and came through on a motorbike tour in 2016). The Germans and Swiss are crazy fast – technically adept but selfish – and it’s the kind of behaviour I hate about biking. I would prefer if speed was better policed in the Pyrenees and Alps. it’s actually the noise rather than the speed that annoys me… the whole valley has to listen to them roaring about in what is otherwise a very peaceful setting – oh well, at least I don’t have to listen to the sound of my gasping for air for a while I suppose! At least you can hear them coming as a cyclist in the moment. The noise is a big problem for the locals, there are petitions, protests and various solutions, like speed humps, strips and more cost money but which solve little. The laws and regulations surrounding emissions from vehicles and air quality are tightening up. Genoa, birthplace of Enrico Piaggio, banned the two-stroke scooter in 2016 and many other cities and countries are following. As well as bicycles, I’m into Vespas and Lambrettas, though it’s a little while since I was last on the road. But the thrill of a trip in Europe was a real highlight and I’d be doing cartwheels never mind high fives if I got my machine over some Alp, I can tell you! The whole thing with air quality is difficult to quantify; if you’ve driven and flown from the UK to southern France to cycle around the Pyrenees, is your carbon footprint larger than if you rode from the UK on a motorcycle or scooter? The roads should be open to all, but everyone should have respect and consideration for others, is how I look at it. Bad air quality in the Pyrenees reminded me of a trip a few years back. I was visiting in and around Prades, but on the way down I found it harder and harder to breathe. Apparently there was some blood rain coming from the Sahara and this was also suppressing the pollution in the area. First time I have ever had an asthma attack – until then I never believed my doctor that I actually had the condition. Air quality (local impact, particles NOx, etc) and climate change (global impact, CO2) are two things that are only partly related. Surely a single person driving a Tesla that is charged with fossil fuel derived electricity generates a larger carbon footprint than someone riding a Vespa. But if I had to choose behind which of those to ride my bicycle I would pick the Tesla. Relating back to Inner Ring’s point about the high fives though, I would say (from my experience at least) that there can be a great sense of camaraderie between travellers on all forms of transport. And cyclists complaining about noise / traffic when they’ve travelled by train / car / aeroplane across a continent or two to get to a destination is a bit like a mobile NIMBY? A Tesla is like any other car: its wheels and tires grind down asphalt and cause small particle pollution that can be more harmful to a cyclist’s health than obnoxious fumes. Studded tyres and the stuff that is spread on roads during the winter are an especially nasty combination.